Having come back to Thailand from Cambodia to make a medical stop in Bangkok, we found ourselves wondering where to go from there. Wanting to avoid Northern Thailand due to burning season, we figured it was time to head south. 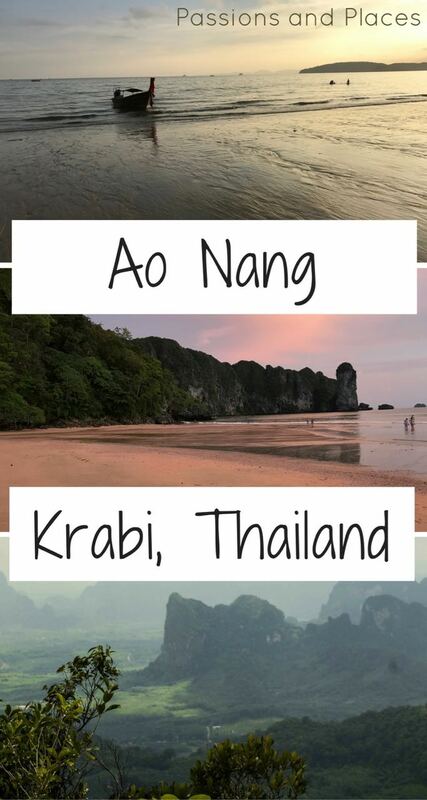 Though it’d never been at the top of our bucket list, we settled on Ao Nang in the coastal province of Krabi, because it was fairly easy to reach from Bangkok. It also looked like a good place to get a glimpse of the karsts that southern Thailand is famous for, and it’s not far from the digital nomad hub of Koh Lanta, which we were eager to check out. 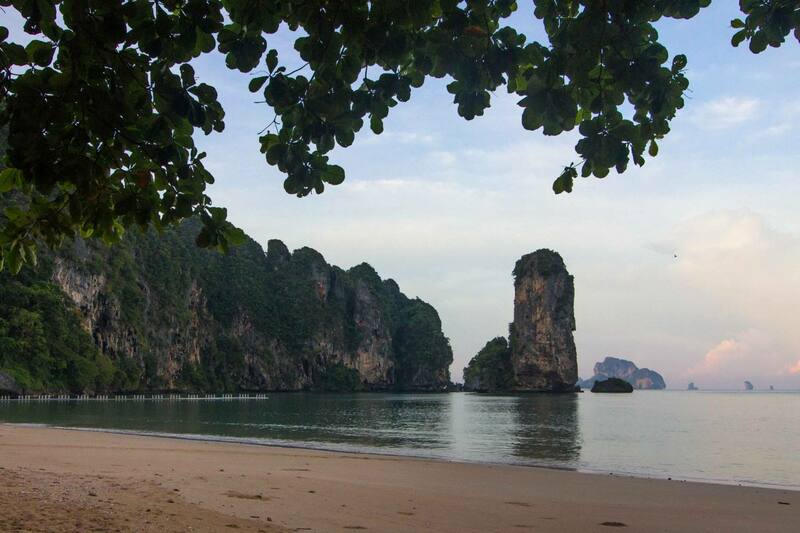 If you’ve ever browsed through a brochure for Thailand, you’ve likely seen images of Krabi. Striking limestone pillars rising from the ocean, beaches dotted with smiling tourists – and enough package tours to make your head spin. Along with the famed island of Phuket just across the water, Krabi is one of the most popular destinations on Thailand’s west coast. Unfortunately, the hordes of visitors mean this region attracts all the problems that come with so much tourism: high prices, aggressive touts, prevalent prostitution, unethical attractions, and the frenetic atmosphere that accompanies travelers who only get a couple weeks of vacation from their high-stress job each year. Ao Nang is a town that feels like it’s built for tourists, not for Thais, and it’s hard to find anything other than package group tours. It’s just not the sort of place we usually look for. Nonetheless, we arrived in this buzzing town determined to find some good in it, and there were things we liked and things we didn’t. 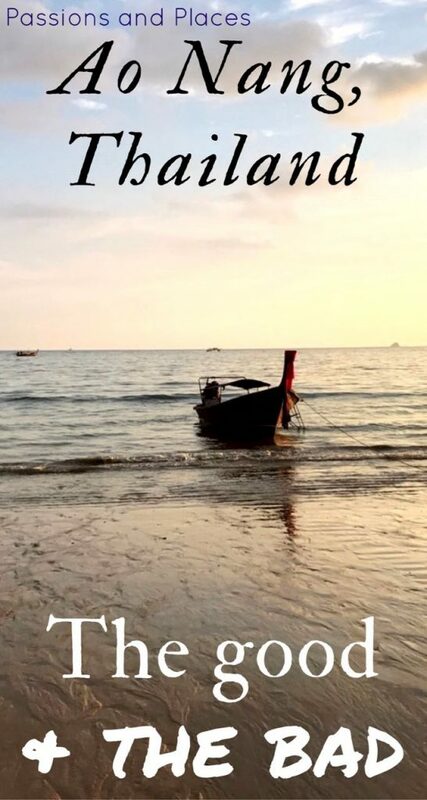 Honestly, we wouldn’t steer anyone towards a trip to Ao Nang, but if you do find yourself there, we hope our experiences can help you make the most of it. While Ao Nang was not our favorite place, it’s popular for a reason. As far as tourist destinations go in Southeast Asia, everything you could need is readily available if you’re willing to pay for it. The Land of Smiles is famous for its beautiful beaches, but many of the best ones take some time and effort, and often a rough ferry ride, to reach. Getting to Ao Nang, on the other hand, just requires a comfortable overnight train ride from Bangkok to Surat Thani and then a few hours on a plush bus from there to Ao Nang. It did seem like a rotten trick that our bus dropped us off at an office a mile outside of Krabi town. They assumed everyone would pay 200 baht ($5.75) for their half-hour transfer to Ao Nang, but we walked into town and caught a songthaew for 50 baht ($1.45) instead. And the ride was much more interesting! Lots of things are expensive in Ao Nang, but nothing seemed quite as overpriced as the food. 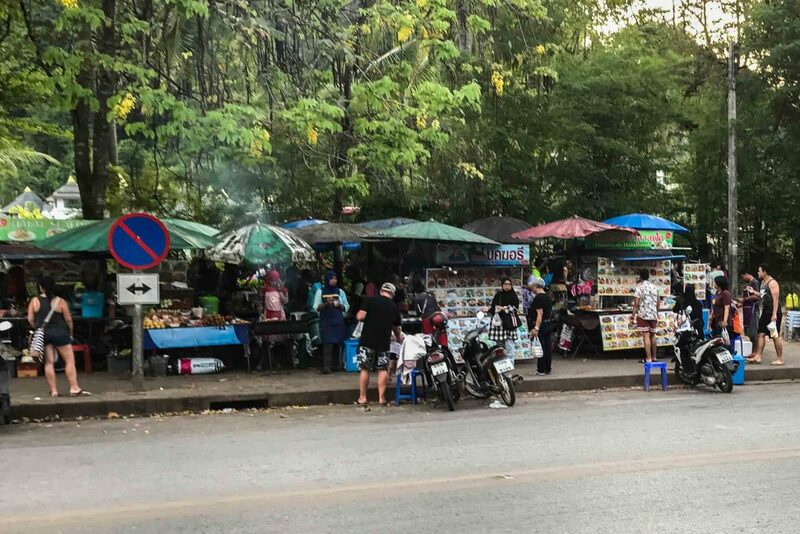 We visited in low season, when many of the restaurants cut their prices by 10-20%, and it was still considerably more than anywhere else we’ve been in Thailand. And while many Thai towns are known for their incredible food scene, it felt like most restaurants in Ao Nang served the exact same half-Thai, half-Indian menu. But we found two good budget options along the smaller Nopparat Thara Beach: the “food court,” a cluster of food stands with outdoor seating next to the Holiday Inn, and the row of street vendors across the road from Krabi Forest Homestay, where we were staying. Both served great meals for $2-$3, which is pricey for street food but a much better deal than the nearby restaurants that cost at least twice that. We also enjoyed a relatively inexpensive restaurant called Mum Aroi at the very southeastern end of Ao Nang Beach. Their Thai food is pretty standard, but it’s one of the few places in town where you can get a table right on the beach. Kayaking through the limestone caves and lush mangroves of Ban Bor Thor was one of our favorite activities. The caves are located a little over an hour from Ao Nang Beach, and driving away from the crowds in town was initially exhilarating. However, as walked down the wooden dock and piled into our tandem kayaks, we realized we didn’t leave the horde behind so much as traveled to find a new one. Even in low season, the river was crowded; it felt like a bumper boats ride, except that I didn’t have a water cannon to push other kayaks out of my way. The main river channel is wide enough to accommodate large groups, but as we veered off to a smaller tributary, the mass of boats got pretty dense. I can’t imagine paddling these narrow sections during high season. 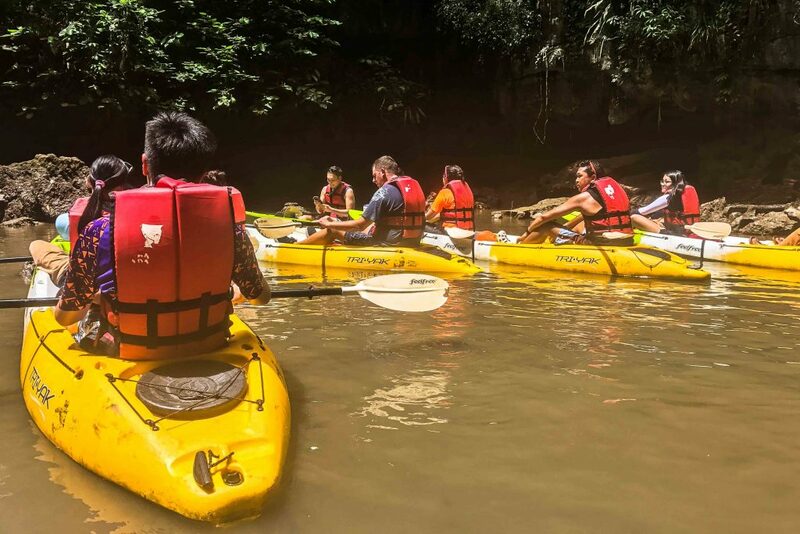 While this might not sound like a ringing endorsement for the activity, the beauty of the caves and the thrill of paddling in and out of stalactite-filled caverns made it really enjoyable. About half way through the trip, our guide also had us hop out of the boats and hike up to a small cave full of ancient paintings. Some of them are so high up and at such strange angles that you have to wonder how they could have possibly gotten there. 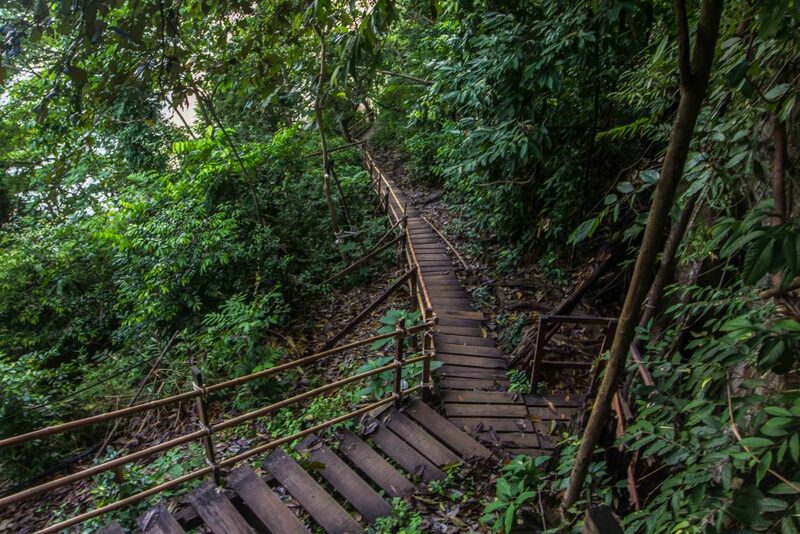 If you want to do any hiking in Krabi, Hang Nak is the place to go. Located inside a national park, the trail climbs almost 1,600 feet to some of the most stunning views we’ve seen anywhere in Thailand. It’s takes about four hours to go up and down the mountain – more if you stop for a picnic at the top or to take a lot of photos like we did. Once you get past the dense forest at the bottom of the mountain, the humidity seems to dissipate and the breeze kicks in, making for a pleasant hiking experience. Still, let me say that this would be a challenging hike at any time of year, but it’s especially difficult in April and May when the heat and humidity are at their worst. I don’t think I’ve ever consumed as much water (or sweat as much) as on this hike, drinking two liters in two hours. However, I can’t imagine how much more difficult it must be during rainy season, when everyone is slipping and sliding down the muddy chutes. 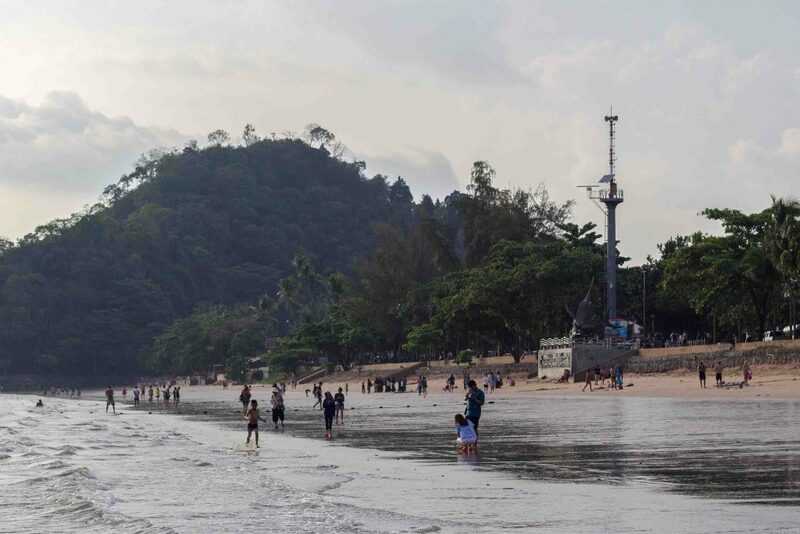 For something a little closer to town, there’s also the Monkey Trail – a series of wooden steps that climbs up and over the rocky cliffs that separate the beach in Ao Nang from Centara Grand Beach Resort on the other side. It gets its name from the monkeys that hang out on the railings there. The resort staff feed the monkeys as they come and go in the mornings and evenings, so the little guys line up like clockwork on the trail. Despite my complaints about how much Ao Nang costs, both of the hotels we stayed in were downright affordable and a great value, thanks to the drop in hotel prices during low season. This collection of bungalows is a thousand feet from the less crowded Nopparat Thara Beach, a few minutes from Ao Nang’s main road. For about $18, we had a huge room with a fridge, super comfortable king-sized bed, electric kettle, wardrobe, and large bathroom with a separated shower (not the standard for budget hotels in this part of the world, where the “shower” is often just a shower head hanging on the wall next to the toilet – yes, it soaks the entire bathroom). 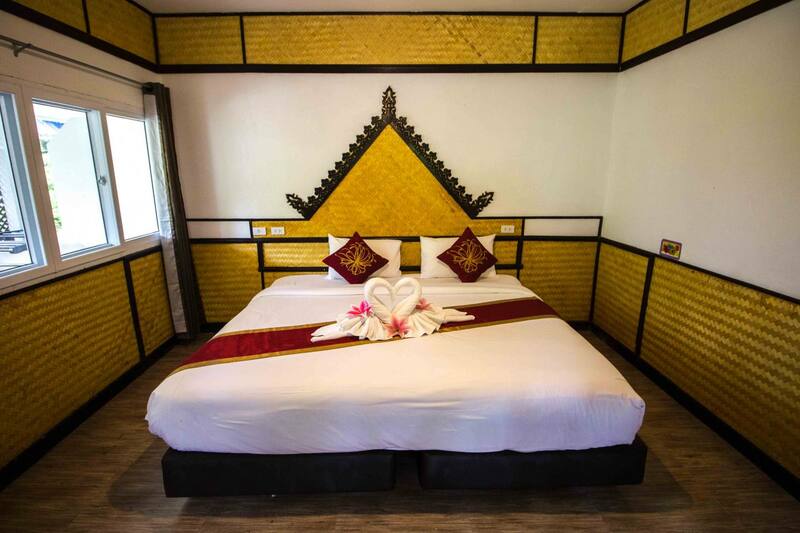 If we were impressed by our first hotel in Ao Nang, we couldn’t have been more pleased with the second (actually just a bit disappointed we hadn’t stayed there the whole time, even though the location wasn’t as convenient), which also cost about $18. With the exception of the separated shower, Little Home Ao Nang has all the same amenities, but also more space and modern decor. 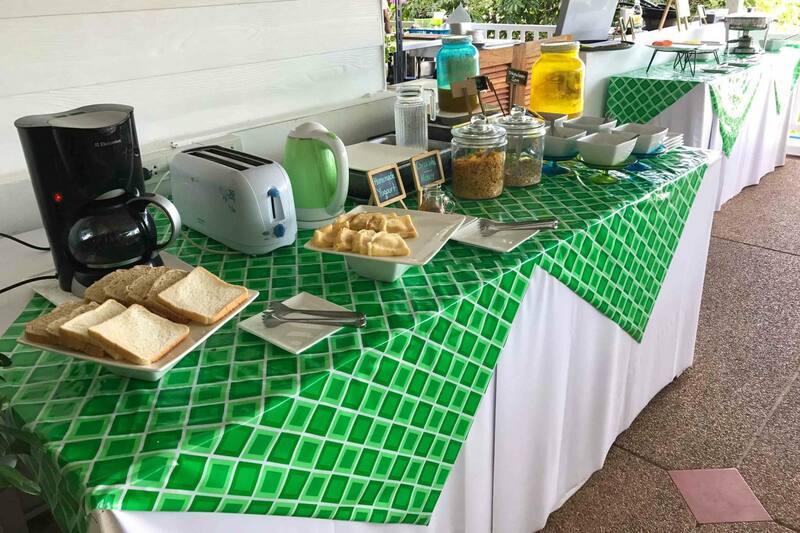 Most importantly, it included an astounding breakfast buffet, including muesli, yogurt, waffles, omelets cooked to order, juice, and coffee. This may not sound like much to people in the States, but for a budget hotel in Thailand, it’s amazing. If you’re looking for a party scene or a very straightforward tourist experience, Ao Nang might be a great place. It just wasn’t what we were looking for, and we can only blame ourselves for not researching it better. When it’s this hot and humid, you go through copious amounts of water, and there’s almost nothing that makes me feel more wasteful than buying bottled water. 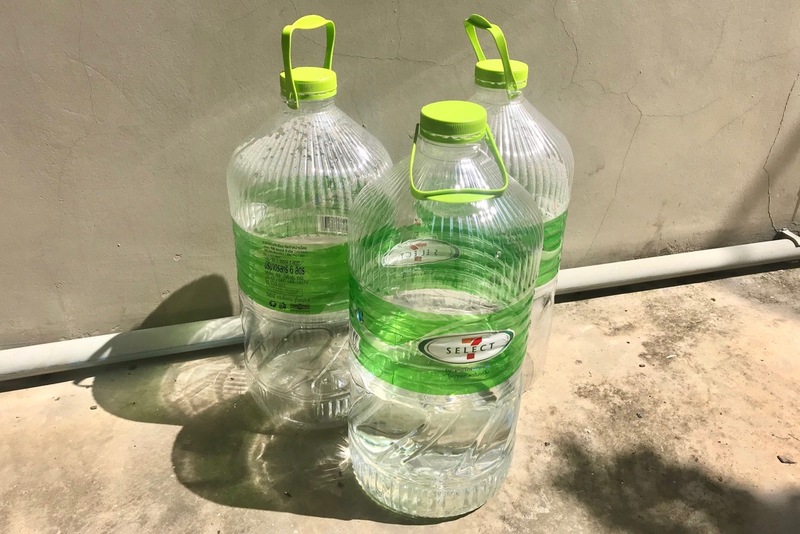 Most towns in Thailand have these wonderful reverse-osmosis machines on the streets, where you can fill up a one-liter bottle of filtered water for one baht, the equivalent of three cents. But those machines are oddly missing in this beach town, meaning the main option is to keep buying bottled water at convenience stores, which costs about ten times as much and generates tons of plastic waste. Some speculate that the lack of water machines is purposeful to force tourists to buy bottled water from the shops in town. I don’t know if that’s true, but we certainly missed those machines after getting so used to them in other parts of Thailand. Leave me alone! I can choose my own restaurant. When every restaurant pretty much sells the same food at the same price, the only way to compete is with advertising. In Ao Nang, this takes the form of restaurant staff standing in the middle of the sidewalks to block traffic and then incessantly badger you to eat there. It goes beyond restaurants, with every tour company, spa, tailor, and bus/boat ticket seller shouting and physically blocking the path of anyone who walks by. This problem is by no means exclusive to Ao Nang, but it was worse there than anyplace else we’ve been in Southeast Asia. I question whether this happens because there’s no other effective means for businesses to advertise, or if there’s a cultural difference I’m not understanding. In any case, we tried to avoid restaurants and other businesses that had overly aggressive touts. 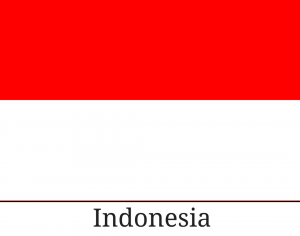 Sooo… This is it for Ao Nang Beach? Krabi Province is most known for its spectacular karsts, but we assumed that such a popular coastal destination would have equally beautiful beaches. As it turns out, Ao Nang Beach is a fairly short, narrow strip of sand that would best be described as consisting of fine gravel (which is incidentally not so different from the beaches in Boston, of all places). However, it was fairly clean, which was surprising since it’s a public beach and doesn’t have resort staff being paid to remove trash and debris all day. But if you’re looking for those postcard-worthy white sand beaches Thailand is famous for, you won’t find them here. Despite this, even during low season when temperatures were at their highest, the half-mile stretch of sand got quite crowded. I can’t imagine how dense it would be during high season. I did enjoy going for a couple runs and a swim at 6am, though, when I could claim the beach for myself. “I’m on a Boat!” …but not going anywhere. One of Ao Nang’s draws is its proximity to the backpacker hideout of Ton Sai and the rock climbing capital of Railay Beach, both just a few miles down the shore. 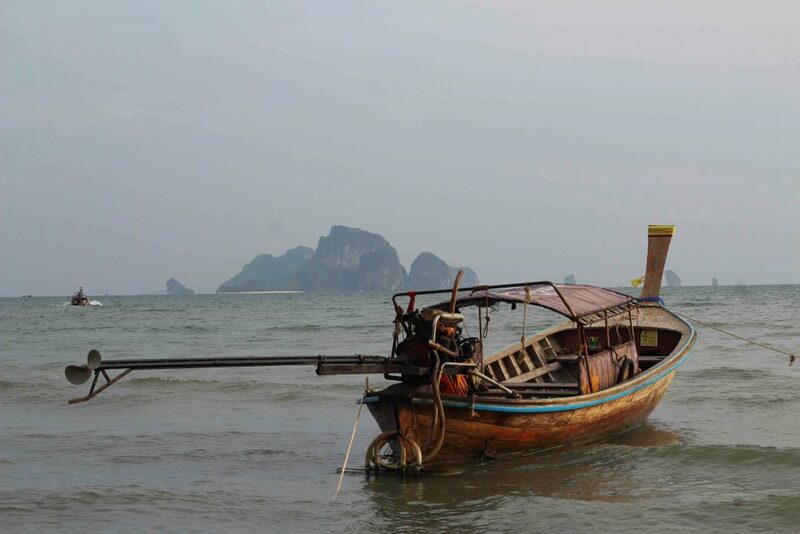 However, the cliffs in between mean you can’t walk there, so the only way to reach either place is by longtail boat. These boats hold ten or more people and leave whenever they’re full, so during low season, that usually means waiting around for an hour or more. 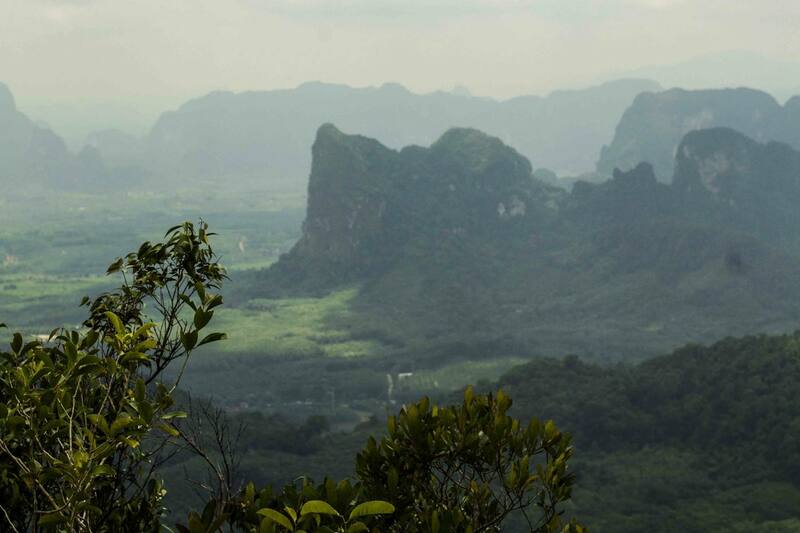 If you’re heading to Ton Sai or Railay for a few nights, that’s not a big deal. But having to wait that long going each way makes a day trip less feasible, especially since you need to be back in Ao Nang by sunset (the boats are available later, but they operate as private water taxis in the evening, costing 800 baht ($23) or more). Of course, if you’re traveling with a big group or you visit during high season, this probably won’t be too much of an issue. None of these points are necessarily meant to discourage you from visiting Ao Nang, just to give you an unfiltered picture of what one of Thailand’s most popular destinations will be like. If you’re planning to visit one of the many nearby beaches – not only Ton Sai and Railay, but also Koh Lanta, Koh Phayam, and Phuket – Ao Nang might be a great place to spend a couple days in between. But if you’re like us and prefer less touristy destinations, just know that its atmosphere will probably grate on you. What places have you visited and not loved? I don’t think my wife and co-blogger would be too happy if I was looking for a Thai girl to take me to the village. 😉 Compared to other parts of Thailand, we found Ao Nang to be more crowded and overpriced, that’s all. 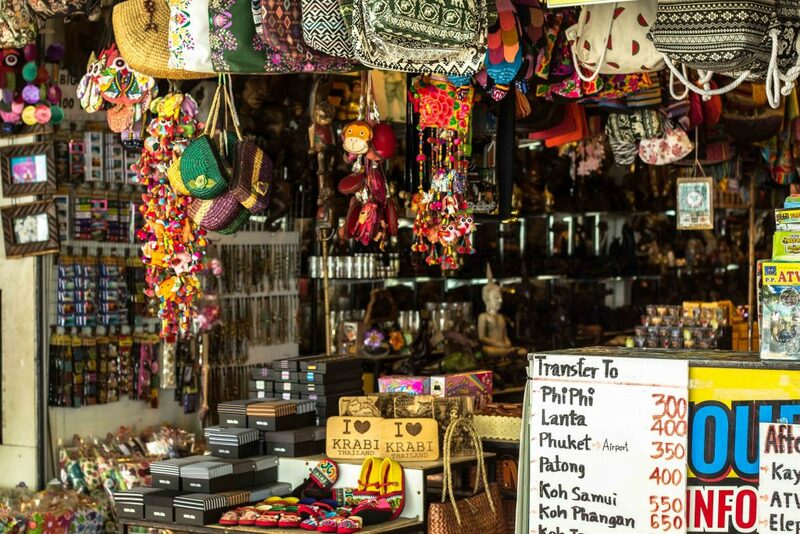 We’ve loved many of Thailand’s popular tourist destinations: Chiang Mai, Koh Chang, Koh Lanta – just to name a few. 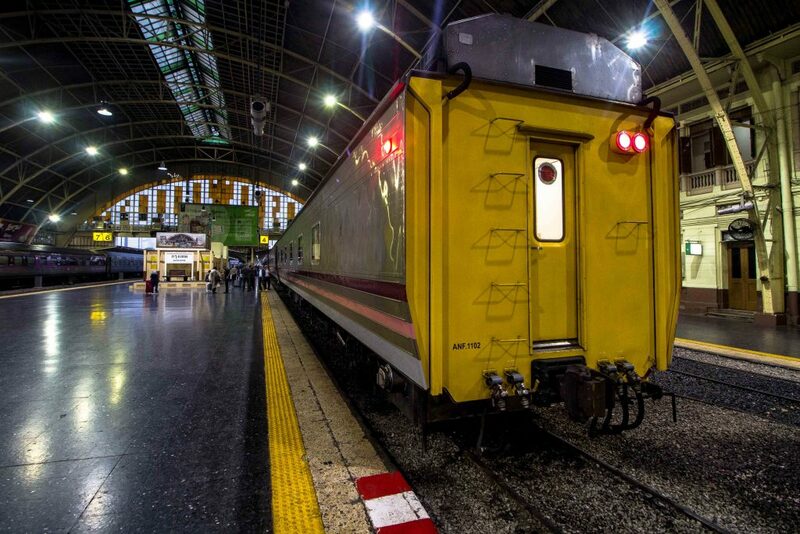 We also really enjoy the train ride there from Bangkok, we take the trains in Thailand whenever we can. I’m so sorry you also didn’t have a good time in Ao Nang. Even a year and a half later, we recall it as being one of the most dissapointing places in Southeast Asia. Hope you’re at least able to enjoy some other parts of Thailand on your trip. I always prefer something less touristy! This is like getting some new perspective on Ao Nang. Sometimes touristy places can be a lot of fun, like Angkor Wat in Cambodia, but we usually lean towards quieter beach destinations.